Third Man Records is turning 10 this year, and the label has revealed plans to celebrate with a special show at its Nashville headquarters on April 6. The concert will boast a headlining set from the Raconteurs — comprising Jack White, Brendan Benson, Jack Lawrence and Patrick Keeler — that will mark the band's first live performance in eight years. Their last album, Consolers of the Lonely, was released in 2008, but they've been hinting at a new album that's expected out later in 2019. The band released two new songs last year and teased a new song called "Shine the Light on Me" last week. 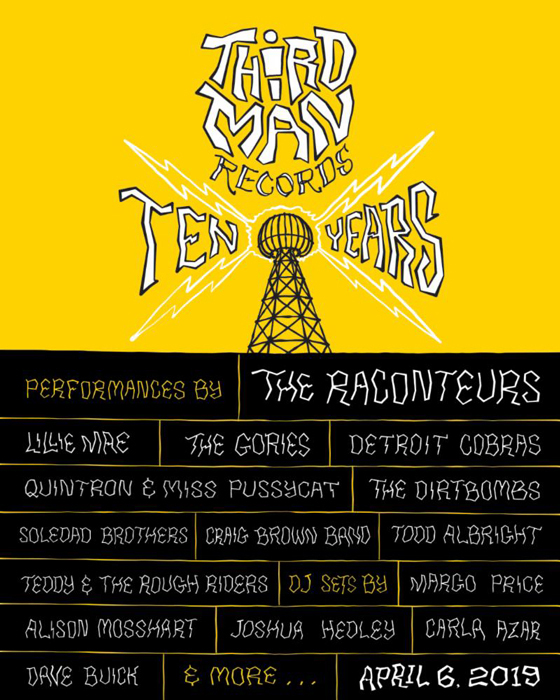 Also performing at the 10th anniversary show are Lillie Mae, Craig Brown Band, Teddy & the Rough Riders, the Dirtbombs, the Gories, Detroit Cobras, Quintron & Miss Pussycat, Soledad Brothers and Todd Albright. Margo Price, Alison Mosshart, Carla Azar, Joshua Hedley and Dave Buick are all listed as special guest DJs at the event. Tickets for the show go on sale this Friday (March 15) at 1 p.m. local time. Third Man Vault members will get access to deluxe "Ultra" tickets beginning at 10 a.m. local time. See full details for the show here.